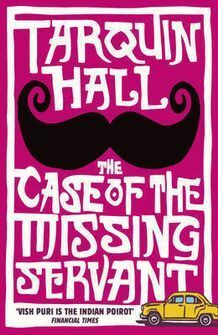 Jeg leser fortsatt The Case of the Missing Servant av Tarquin Hall: The portly Vish Puri is India’s most accomplished detective, at least in his own estimation, and is also the hero of an irresistible new mystery series set in hot, dusty Delhi. Puri’s detective skills are old-fashioned in a Sherlock Holmesian way and a little out of sync with the tempo of the modern city, but Puri is clever and his methods work. The Case of the Missing Servant shows Puri (“Chubby” to his friends) and his wonderfully nicknamed employees (among them, Handbrake, Flush, and Handcream) hired for two investigations. The first is into the background of a man surprisingly willing to wed a woman her father considers unmarriageable, and the second is into the disappearance six months earlier of a servant to a prominent Punjabi lawyer, a young woman known only as Mary. Puri and Tubelight sat together on the back seat of the Ambassador as Handbrake drove to Jaipur airport. ‘How many of your boys have you got watching Munnalal?’ asked the detective.